I’ve been a One Piece for a long time now. There. I said it. Not that it’s really admitting to anything, but I remember the days when liking any anime was a particularly nerdy thing. I guess that’s hard to shake… I remember watching Sailor Moon after school (as a teenager) and if anyone came home early I immediately turned it off because no one could ever find out. Looking back, I don’t know why I cared. But that’s not the point of all this. I recently had a pretty serious realization. I’ve been drawing since I was a kid (that’s not the realization). That’s n years of experience playing with various media and styles. 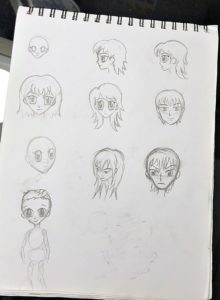 Up until a few weeks ago, I had never – not once – drawn anything in an anime or manga style. Not really sure why, but it just never occurred to me. Maybe I was perfectly happy just taking it all in! Not too long before that epic realization, I had already started playing with the style. A book was totally necessary (because I like having a physical reference) and I started drawing along with the examples. I was bored after a few pages, but still flip through it here and there, just like all of my other art books. 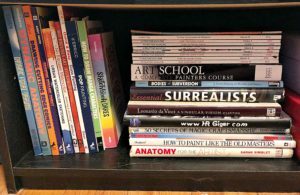 I know it’s easy enough to find references for free online, but I like books! 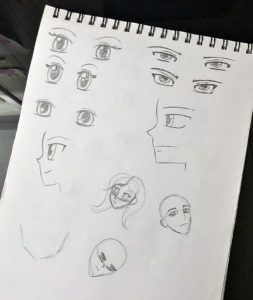 So I have some quick doodles of floating heads with different expressions, some from the book and some from my brain. Some are sober art, some involved *a touch* of wine. I got bored with that, too. Have you noticed I get bored easily?? 🙂 The only thing is I don’t know if I was really bored with it or uninspired or worse – am I just not creative? At this point it made sense to start drawing from my favorite anime and manga characters, but it’s not creative if it’s copying, right? But the copying can lead to ideas, right? And who’s to say what’s creative and what’s not? *sigh* In the future I might reusing part of that first paragraph: Looking back, I don’t know why I cared. 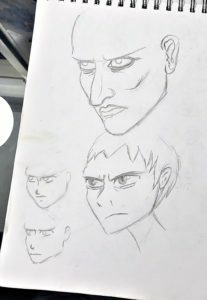 At first I figured I’d start drawing some characters and they’d never see the light of day because they don’t fit in with anything else I’m currently doing and that. is. STUPID. Here’s the first few. Luffy from One Piece was first. 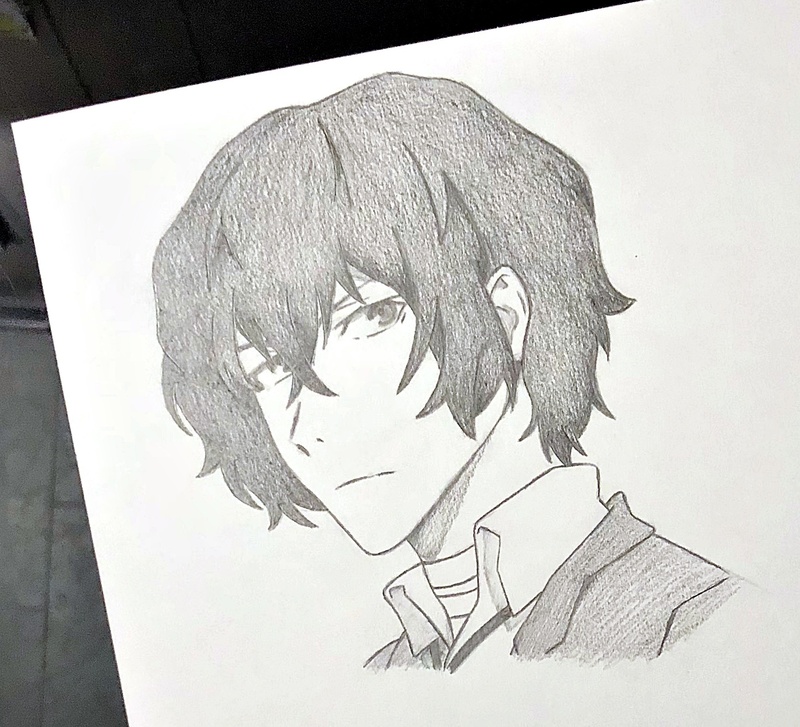 He’s my *second* favorite from that series, but he’s pretty simple to draw. It was a nice warm up and I got to remember the subtle differences in how he looked pre-timeskip. He’s having a serious moment, ok? Who’s my all-time favorite? Zoro. Always has been and always will be. I fangirled over Law for a short time because lots of us did (and still do), but Zoro will always be my favorite. As someone who can get lost making only right turns, I guess I can relate to the guy. He was the next one I drew (obvs). 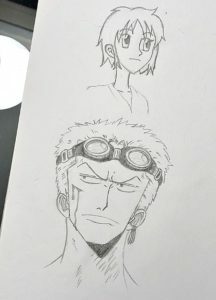 Floating Head Goggles Zoro. 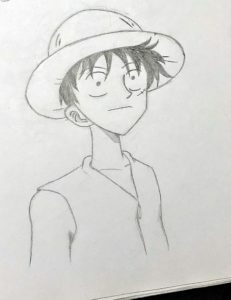 <3 I also drew a girl that was supposed to have the same expression as Luffy. Success? The face came out a little too thin for Zoro and the floating head look isn’t a good one. The paper in that sketchbook is also total garbo (it’s the “junk” book). 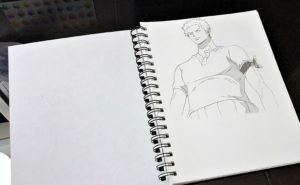 Now I have sketchbook dedicated to anime characters and guess who’s on the first page? 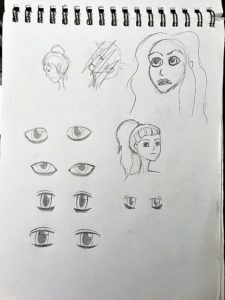 Eyes and a couple of profiles from the book, followed by nonsense. 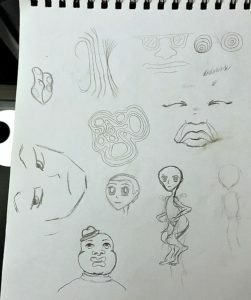 The face on top was already on the page, so I sort of based the other faces on it kinda? 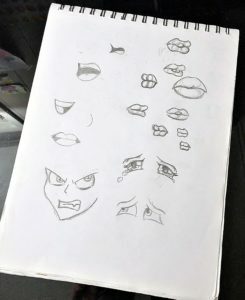 I drew a bunch of mouths and lips. I still draw lips based on some stuff from a book on drawing comics. Then some emotions. Oh, the emotions!